We conduct our corporate training programs with a clear vision right from designing a particular training program until its successful execution. Every step in this process is carefully monitored with the help of a strong pool of trainers. You may find companies which either specialize in In-house training programs or outbound training programs. Rarely does one single company excel in both. We are the ones who blissfully command expertise in both In-house as well as outbound training programs. Our training programs are an intermingling of In-House & Experiential Learning. It won’t be an exaggeration to articulate that this exclusive proficiency has helped us in gaining repetitive opportunities for conducting our training programs with wide ranging patrons. Our training programs have helped us to from a ‘out of the ordinary’ relation with our clientele; a relation which starts with a single training program and goes on developing, becoming stronger and healthier with a chain of knowledge imparting programs. 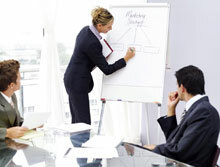 The Corporate Training Programs must support the individual business objectives and goals. The training should also sync up with the corporate environment and organizational practices of the company. Corporate training programs need to be effective and efficient. Part of corporate training is to accentuate the workforce’s core knowledge and learning processes all the while reinforcing company vision and ideology. The training programs must not be generalized but customized according to the client requirement.